When I first started Girl Of All Work, I'd dreamed of having our products go international. Now you can find our products in Chile! 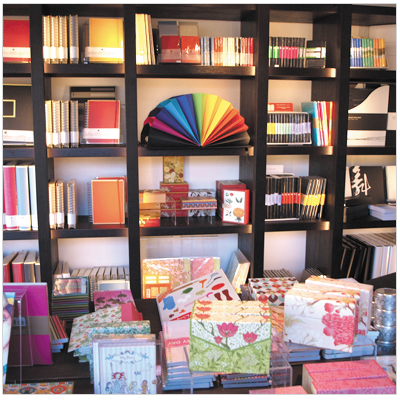 We were so excited when we met Antonia Risopatron, proprietress of Papelaria, a franchise of two beautiful, upscale stationery stores in Chile—one in Santiago, and the other in Parque Arauco. I was struck by the black modern storefront and just the lovely array of colors and textures carefully composed in both stores. We were honored to be in the midst of such great company! Antonia was kind enough to answer a few questions we had for her from starting her own business to what was on her bookshelf. Girl Of All Work: What inspired you to open your store? How did you come up with the name? Antonia : It was a long dream for me. I've always loved papers. Paper products are a delight for me. That's why I finally decided to open a store. My friends also encouraged me to do this. 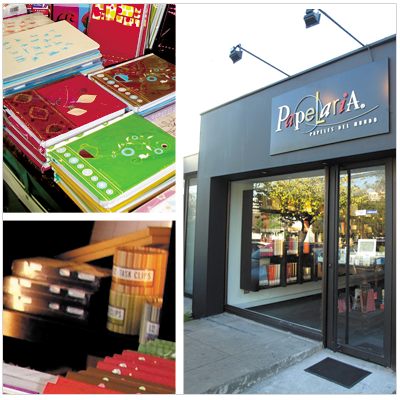 In Chile, there is no other stationery store, out of Papelaria. The name is similar to the word "papelaría," which means papery in Spanish, but it sounds different and is easier to remember. G: When did you open your doors? G: What are you reading right now? A: I am reading a book about the life of Michel Angelo Buonarroti and The Agony and the Ecstasy by Irving Stone. G:Where have you travelled recently? A: To New York last May. I really enjoy the city, it's full of life. G: If you weren't doing this, what do you think you'd be doing? A: Really, I am so happy with Papelaria, that I haven't thought of anything else to do! Antonia's store is lovely! I'd definitely visit if I was taking a trip to Chile. The bright colors are great. Many of us seem to prefer electronic files these days instead of the printed or hand-written ones on paper, but with eco-friendly efforts - we get to appreciate paper once more. Seeing all the different combination of bright colors show that we can still make use of old shredded newspapers or other kinds of paper documents and turn them into something beautiful and useful once again.